suka mana? dadar apa mata sapi? Brand new restaurant just opened in Seminyak area. The name is Sambal Shrimp. It’s located in jalan drupadi, seminyak. Google Maps: -8.682979,115.164365. The place was japanese restaurant before. It’s fully renovated while still keeping the old wooden house style. The place is on second floor.. parking area is ok.. can fit around 6 cars.. the security guys are excellent.. they bought me cigarettes haha.. They have 2 outdoor areas.. quite large one at the front.. small one at the back.. the main area in the middle.. quite large also.. low dim light.. all wooden furnitures.. it’s nice.. no air conditioners however..
Their best menu is the sambal shrimp of course.. as the name says.. I tried it with some additional sambals like sambal matah and terasi.. if i’m not wrong.. This shrimps was really really nice.. the taste of the prawn and herbs was perfect.. I also like both sambals.. really nice.. But.. it’s expensive.. 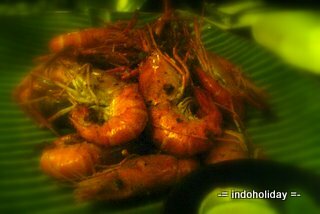 The sambal shrimp itself was 150K.. about 300gr.. see the picture above.. You have to order min 300gr.. I spend 230K for the prawn, 2 little sambals, 1 bowl of rice and 1 coke.. the portion was not even 1/4 of my stomach.. i’m big anyway.. other foods was also expensive.. fine dining restaurant prices.. I like the food but not the price.. the place is nice but not good enough for fine dining.. If they are cheaper.. like half of their prices now.. I would go three times a week!